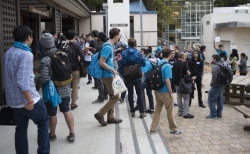 The second annual 32-hour UCSC Hack-a-thon, HACK UCSC!, enticed a crowd with $80,000 in prizes and produced nine top-three winning teams in three categories. In the Innovation category, defined as "any creative tech that blows the judges away," Avi Varshney took 1st place, $4,000, for his humanoid robot that tracks and moves in sync with its human user. 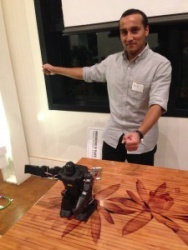 Avi's app uses Xbox Kinect, thus eliminating the need for the user to wear sensors. 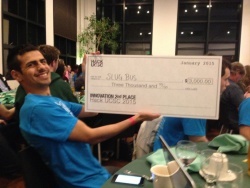 The SlugBus team took 2nd place, $3,000, with its bus-tracking mobile app. The Stingr team took 3rd, $2,000, with the Stingr app that uploads photos and videos and lets users up-vote the best content, creating an online collage of users' top-voted content. In the Ag Tech category, defined as "tech that addresses an agricultural problem," the Plant Anywhere video game took 1st, $2,000, It uses real-time data from CityBlooms' light and motion sensors to predict how plants would grow in a particular field. The Make it Rain app, 2nd place, $1,500, also uses CityBlooms' data to allow the user to change light levels and increase or decrease water to a site remotely from online. The 3rd place winner, Carbon Footprint tracks the efficiency of the user's driving. In the Tech Cares category, defined as "tech that addresses a social justice or environmental problem," Recyclops won 1st place, $2,000. This app allows the user to scan the bar code of a product to determine if its packaging is recyclable. Team Jeanne won 2nd place with its Pebble Watch app. It improves elder care by managing medicine and activity regimens online and alerting the user when it's time to take medicine or engage in a healthful activity. It also alerts the user when medication or activity has been missed. 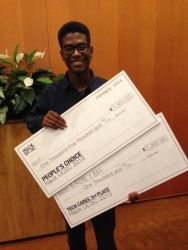 Eron Lake won 3rd place, $1,000, and the Hack-a-Thon's People's Choice Award, $1,500, the latter voted for by attendees rather than selected by the judges, with his Cell Game video game, an educational game that teaches students how biological cells work.